The longest Christmas celebration in the world happens in the Philippines, starting when "Ber" months comes, and here at Kenny Roger's Roasters, we celebrate with the Filipino people. With every brightly decorated household or store, sometimes, hearing the Christmas carol played in malls and over the radio, you can feel this as the nights get colder and longer. And you can taste this as traditional Christmas dishes are served. It’s no secret that Filipinos tend to go over the top and beyond to celebrate this season, especially with the people closest to us. Let us celebrate this season in the grandest and heftiest way possible the way only Kenny Rogers can do. 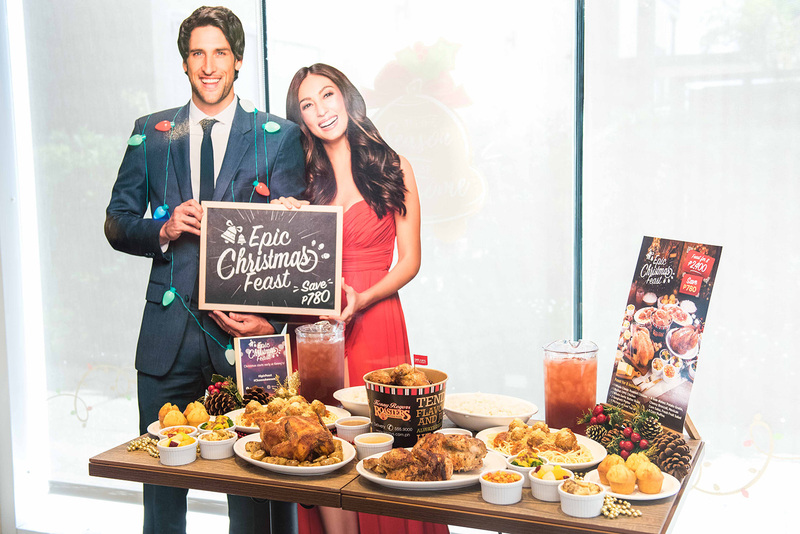 Presenting Kenny’s Epic Christmas Feast, where you can enjoy a deliciously healthy holiday extravaganza with your family or barkada. This awesome feast for eight (8) includes all of Kenny’s best sellers! Get ready to indulge in the mouth-watering goodness of one (1) whole Classic Roast Chicken, one (1) whole Garlic Butter Roast and one (1) bucket of OMG Unfried Fried Chicken! Epic Christmas Feast also includes two (2) Spaghetti Platters and two (2) orders each of these side dishes: Cheesy Broccoli, Potato Gratin, Mexican Corn Salsa and Fresh Fruit Salad! And to complete the Epic Feast, it comes with eight (8) cups of rice, eight (8) corn muffins and two (2) pitchers of Iced Tea or Soda. All for the awesome price of Php 2,400! Be sure to check out one of Kenny Roger's newest side dish the Cheesy Broccoli, it can truly surprise you on how good it tastes. Hurry down to Kenny Rogers Roasters and celebrate Christmas with family and friends with the Epic Christmas Feast, trust me the feast is at least good for 10, less the rice or course. This bundle is now available to order and feast on at all Kenny Rogers Roasters branches, available for dine in, take-out and delivery. Best of all you can save as much P780 for Kenny's Epic Feast now that's great value!